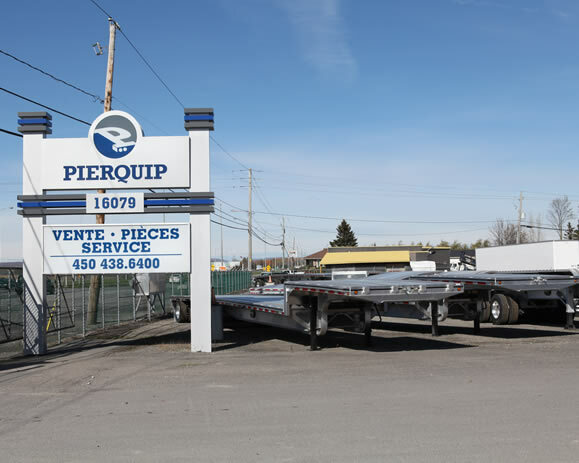 Pierquip Inc, specializing in New & Used Transport Trailer Sales, Financing, Parts and Service. Proudly serving Quebec, Ontario and the Maritimes. We have a wide selection of new and used inventory, which is available for you to browse online. Our head office is located in Mirabel, Quebec. We also have a convenient location in Mississauga, Ontario to better answer your needs. Pierquip Inc. is proud to be associated with recognized semi trailer manufacturers in the industry offering models such as: dry trailers, refrigerated (reefer trailer), platform or drop deck trailers, manufactured by recognized OEMs: Hyundai Translead and MAC Trailers. We also have specialized trailers branded as XL Specialized. Call us at 1 (888) 966-9689.